For most Japanese, taiko simply means "drum." 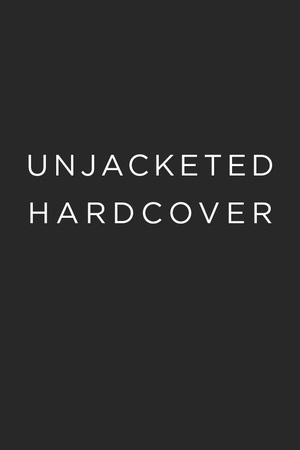 In this book, the term is used in a more technical sense to signify a subset of Japanese percussion. Japanese drums are typically differentiated based on their size, shape, and material composition. Drum shells hollowed out from blocks of wood are classified differently from drum bodies made up of individual wooden slats, like a wine barrel. Drums also differ based on the kind of dried animal skin used for playing surfaces and the methods of attaching skins to the drum body, either by ropes, tacks, or bolts. Drums also are sounded in distinct ways (by hands, sticks, or mallets) and are employed differently in the three main genres of Japanese performance: music of the imperial court (gagaku), music accompanying the classical stage performing arts (koten geinō), and music used in religious ritual or the folk performing arts (minzoku geinō). Prior to the emergence of ensemble taiko drumming, taiko drums were used most extensively within the folk performing arts. This historical context contributed significantly to the development of taiko in the postwar period. In contrast to the classical performing arts of the stage or music of the imperial court, the lack of strict control over performance and instruction within the folk performing arts gave individuals the flexibility to use these instruments for performance ensembles. The fact that there was specifically a taiko boom is therefore not merely coincidental but reflects the particular structural location of these instruments within Japanese musicality. Just as the popularity of ensemble taiko has brought taiko from rare and restricted use in the classical arts to the focal point of dynamic stage performance, it has also raised the cultural standing of taiko makers in Japan. Previously relegated to outcast status for the occupation of drum making, which for generations had been deemed "polluting," taiko makers from the latter decades of the twentieth century onward enjoyed both high demand for their drums and growing recognition for their art. The higher profile of the instruments and those who make them is both evidence for and a consequence of the taiko boom. Instruments and instrument makers have moved from marginal positions to the center of Japanese cultural life. Gagaku is the music and dance of the Japanese imperial court. It has its origins in older court music from China and Korea, which was brought to Japan in the fifth century, and from India, which arrived in the seventh and eighth centuries. In 701, imperial authorities established an imperial music bureau to oversee performances of court music. At the time of the bureau's establishment, most musicians in the imperial court remained Chinese or Korean, and the creation of a distinctly Japanese variety of court music did not occur until the middle of the ninth century, when a group of noblemen under the leadership of former emperor Soga arranged the divergent mass of styles that made up contemporary gagaku into the form they take today (Malm 1959, 89). Since the Soga reforms, court music performances have been divided into two parts: one devoted to music of Indian and Chinese origin (tōgaku) and the other to music of Korean and Manchurian origin (koma-gaku) (Malm 1959, 89). Each of these is further subdivided into instrumental music (kangen) and dance music (bugaku). The type of drums used changes depending on whether instrumental music or dance music is being played. For example, the dadaiko, the largest of all the gagaku drums, is used only in performances of dance music. It has a carved-out wooden body and is covered on each end by cowhide drum skins that are held to the drum by long ropes tensioned with wooden pegs. A decorative wooden flame envelops the front head of the drum, which is imprinted with a mitsudomoe pattern (a yin-yang symbol with an extra teardrop). When struck with a felt-tipped mallet, the drum produces a low and resounding boom. Impressive as it is, the drum is used sparingly for percussive effect (for example, when a dancer stomps his foot on the stage). In performances of instrumental music, a gaku-daiko is used in place of the dadaiko, to similar effect. The gaku-daiko, which is about half the size of the dadaiko, is suspended from a wooden frame, and its cowhide drum skins are held on by a series of drum tacks. Gagaku ensembles also make use of two smaller drums, the san-no-tsuzumi and the kakko. Like the dadaiko and gaku-daiko, these drums are used alternately in performances of tōgaku and koma-gaku. The san-no-tsuzumi, a small hourglass-shaped drum of Korean origin, is played only during performances of koma-gaku. Positioned on its side, the drum's front is struck with a thin stick in one of a limited number of short patterns. The kakko drum is a barrel-shaped drum of Indo-Chinese origin that has two rope-fastened deerhide heads. In contrast to the san-no-tsuzumi, the drum is struck on both sides during performances of tōgaku in one of three simple patterns: a slow descending roll, a tap with the right stick, or a press roll with the right hand. In sum, the four drums of gagaku are used for effect more than for sophisticated timekeeping. Musicians and performances of gagaku are strictly regulated by the Music Department of the Imperial Household Agency. The regulations have helped preserve gagaku since the ninth century (much of the original Indian, Korean, and Chinese court music has long since disappeared), but they also have prevented significant innovation. Although some musicians have left official court music to experiment with combinations of court music and orchestral music (Lancashire 2003), to my knowledge no ensemble taiko group has integrated the instruments or motifs of court music into its performance. The ensembles of classical Japanese theater have been a much greater source of inspiration. Noh is a kind of Japanese theater that developed from folk theatricals in rural villages and towns (Malm 1959, 106). The first of these, sarugaku, or "monkey music," was a form of comic theater derived from ritual performances at Shinto shrines. Sarugaku was augmented in later years by the addition of Chinese acrobatics (sangaku) and the rice-planting dances of peasants (dengaku). These two forms of sarugaku remained virtually indistinguishable until they were formalized and stylized in the late fourteenth and fifteenth centuries by a father-son duo, Kannami Kiyotsugu and Zeami Motokiyo. Both men were affiliated with a shrine in Nara and were sent by the shogun at the time, Yoshimitsu, to Kyoto, where they combined contemporary sangaku with Buddhist chanting to create a new hybrid theatrical performance called sarugaku-no-noh. Sarugaku-no-noh, which came to be called Noh, was heavily influenced by the Zen Buddhist emphasis on "restraint and allusion" (Malm 1959, 108). In its current form, performances of Noh include long periods of chanted dialogue ("song") and slow, highly scripted movements ("dance"). Songs and dances are accompanied by an ensemble (hayashi) made up of a flute called the noh-kan and three drums: ko-tsuzumi, ō-tsuzumi, and taiko. The ko-tsuzumi is the smallest of the three drums. It has an hourglass-shaped body made of zelkova wood, much like the san-no-tsuzumi used in court music, and two rope-fastened horsehide heads. The inner shell of the drum is carved with a special pattern to improve resonance and timbre, and a small piece of deerhide is applied to the center of the bottom drumhead to control reverberation. A ko-tsuzumi player places the drum on his left shoulder and strikes it with the fingers of his right hand. Tightening or loosening the tension on the ropes running the length of the drum raises or lowers the pitch of the drum. Skillful manipulation of rope tension, together with various finger strikes, produces the five basic ko-tsuzumi sounds. The ō-tsuzumi is shaped like the ko-tsuzumi but is slightly larger. Two sets of ropes extend along the body of the ō-tsuzumi from cowhide heads on each side. One set holds the drumheads to the body; the other wraps around them and is tightened or loosened, as in the ko-tsuzumi, to raise or lower the pitch of the drum. The drum skins are made out of cowhide, not horsehide like the ko-tsuzumi. In contrast to the ko-tsuzumi, which is held by the left hand on the right shoulder and then struck with the right hand, the ō-tsuzumi rests on the performer's left hip and is struck with a sideways motion of the right hand. Deerskin thimbles are sometimes used to enhance the sounds produced by the drum, which are divided into three basic types, ranging from strong to weak. The barrel-shaped body of the noh taiko differentiates it from the two hourglass-shaped tsuzumi and defines it as a type of taiko. A block of zelkova wood is carved out to fashion the body of the taiko, which is approximately six inches deep and twelve inches across. Two drum skins, made either of cowhide or horsehide, are held to its body by tightly drawn ropes. The drum rests horizontally on a stand that keeps it several inches from the floor, and it is struck with two lightweight sticks whose ends taper slightly. Noh taiko are, therefore, distinguished from tsuzumi drums not only by their barrel shape but also by the use of sticks, instead of hands, to produce sound. Varieties of shime-daiko used in the folk performing arts have slightly thicker heads, which allow for higher pitch and greater durability. Since Noh theater grew out of folk performing arts like sarugaku, it is appropriate to think of the noh taiko as a lighter-weight version of its more robust folk cousin (figure 3). Originating in the risqué riverbed dance-theater of a Kyoto shrine maiden named Okuni, kabuki evolved into a form of popular theater more suited to the urbane tastes of merchants and city dwellers than Noh (Foreman 2005, 38). Still, a debt to the Noh theater is evident in the conservation of the Noh ensemble in kabuki theater. Together with the shamisen (three-stringed Japanese lute), the instruments of the Noh ensemble are the major source of musical accompaniment for kabuki performances. Drummers in kabuki ensembles use drum calls (kakegoe) to mark time and coordinate their performance, as in Noh. In addition to this ensemble music, musicians concealed in an offstage area called the geza provide sound effects. The geza houses a myriad of percussion, including the drums of the Noh ensemble as well as the larger ōdaiko and okedō-daiko. Like the shime-daiko, the barrel-shaped ōdaiko is carved out of a single block of wood, but it is much larger-approximately four to six feet in diameter and slightly smaller in height (figure 4). Its two cowhide drumheads are fastened to its body by a ring of metal tacks, like the gaku-daiko. Ōdaiko were originally used to advertise kabuki performances. In those early days, the state of kabuki theater was so tenuous that audiences would not know whether performances would take place until they heard the sound of the ōdaiko. In contemporary kabuki, the ōdaiko is played in the concealed geza with long, thin bamboo rods to create sound effects, such as falling snow or rain. The okedō-daiko (or daibyōshi) is similarly barrel-shaped, but it is constructed out of individual staves, not a hollowed-out shell. The staves are held together by two hoops, and the drumheads are fastened with ropes to the drum body, which has similar dimensions to the ōdaiko (figure 5). Evoking its origins in the folk performing arts, it is used in the geza to create the atmosphere of a "folk" festival. In size and form, the okedō-daiko and the daibyōshi are indistinguishable-the name daibyōshi being merely the lingo of geza musicians. Along with several types of gongs and mallet percussion, geza musicians augment the sounds of these two taiko with gaku-daiko, for scenes depicting war, and the uchiwa-daiko, a fan drum, for other percussive effects. Noh and kabuki, along with court music, are classified together in Japan as hōgaku, or "music of the homeland." In common usage, hōgaku is opposed to yōgaku, or "Western music." In addition to its connection to stage theater or court music, musicianship in the world of hōgaku is strictly regulated-one usually cannot begin stage performance without passing through an apprenticeship of ten years or longer. The strict regulation of training and performance distinguishes Noh, kabuki, and court music from the music of Japanese ritual and festivity. The music of Japanese ritual and festivity derives primarily from a collection of religious practices and worship in Japan dedicated to ancestors and supernatural spirits (kami) called Shinto (Kawano 2005). At structures enshrining particular spirits, formal rituals evolved into the sacred music and dance called kagura, or "god music." Kagura is typically divided into two types: music for Shinto functions or formal parts of ceremonies at local shrines (mi-kagura), and music that accompanies Shinto festivals (sato-kagura) conducted at important seasonal moments in the agricultural cycle. The often-spectacular grand processions associated with contemporary Japanese festivals descend from sato-kagura. The music that accompanies these rituals and processions (there is no completely instrumental folk music) is provided by ensembles typically made up of two kinds of taiko (small shime-daiko and larger chū-daiko), Japanese flute (fue), and small brass gongs (atarigane). Chū-daiko are smaller versions of the ōdaiko used in the kabuki geza. Chū-daiko, also called miya-daiko, are the most extensively used variety of taiko in the contemporary taiko ensembles that are the subject of this book (figure 6). The appellation miya, which means "shrine," derives from the near ubiquity of these drums in Shinto shrines. (They are also found commonly in Buddhist temples.) The extensive use of chū-daiko in kagura, festival processions, Bon dance, and other forms of the folk performing arts relates directly to the consolidation of the majority of the Japanese population under the religious institutions of Shinto and Buddhism. Festival ensembles are often named for the areas where they originated, a custom that reflects the Shinto emphasis on marking place through ritual (see Kawano 2005). Although their rhythms can be complex, they are usually rather slow and timed to coincide either with dances or with movements in a procession (Malm 1959, 50). That said, of the three types of music discussed here, festival music is where taiko drums play the most central role. Organized around rhythmic cadences rather than harmonic motifs, the drumming of festival ensembles is more extensive than that found in other kinds of indigenous Japanese music, such that "the importance of the drum as a center of many Japanese folk dances is little realized by the casual visitor to Japan" (248). Taiko, especially chū-daiko, also retain an important position in Buddhist ritual. Shōmyō chants, based on sacred Buddhist texts and hymns, are sung to the steady rhythm of the chū-daiko drum. During the annual summer Buddhist festival of O-Bon, chū-daiko drums accompany festival dancing and singing. In fact, it is from the musical accompaniment to this ritual that one influential style of ensemble taiko derives (see chapter 2). During the rituals of the Nichiren sect of Japanese Buddhism, fan drums, mentioned earlier in connection with the music of the kabuki theater, are also used to accompany enthusiastic chanting. The division between folk performing arts and religiously inspired festival music is ambiguous, because most of what is called "folk music" in Japan, with the exception of some folk songs or work songs, is derived from religious festivals or worship. Yet the folk performing arts are usually considered distinct from religious music and the performing arts of the stage, even though classical performing arts like Noh and kabuki have roots in just these folk entertainments. Whether or not they are considered separate from or part of religious music, folk performing arts are distinct from the classical performing arts in several other respects. First, classical Japanese music includes specific artistic styles indigenous to Japan that are performed on a stage. Although many folk performing arts are currently performed on a stage, they were not originally created for that purpose; rather, they were created by a particular community for that community, usually as a part of a religious festival or ceremony. Second, and as a corollary of the first, compositions in the classical performing arts typically have a specific author or composer. By virtue of their being created within a community sometime in the past, however, folk performing arts are by definition authorless. Third, classical stage music is typically notated, and performance is legitimated by proper reproduction of that score. Although notation often leaves much room for interpretation, which makes long-term study with a teacher important, texts continue to play an important role in the classical performing arts. In contrast, folk performing arts typically have little to no basis in notation and are usually transmitted orally. Lack of notation and the custom of oral transmission leave space for more play and individuality in performance. Finally, whereas the classical performing arts have taken root and developed in urban centers, the folk performing arts have historically been identified with rural communities, especially those that originated before the end of World War II. Reflecting this provincial basis, folk performing arts have also been referred to as "local" or "regional" arts. In sum, as one moves away from the realm of court music and classical theater toward the domain of the folk performing arts, the prominence of drums and drumming increases, especially on chū-daiko. When thinking about newer taiko ensembles, it is important not to ignore their ties to religious rituals and communal celebrations, both of which are distinct from the rarefied performances of court music and classical theatrical ensembles. For much of Japanese history, the customs and celebrations of the common "folk" were looked upon as crude and vulgar in comparison to the refinement of the classical stage arts, with lack of notation and unregulated transmission providing yet further testimony. However, in the aftermath of World War II, the transformation of these rude and vulgar customs into symbols of national-cultural heritage paralleled the elevation of their central symbol, the taiko, into a symbol of a new Japanese performance culture. This same elevation applies to those who have worked for generations to fashion these instruments for the use of ritual specialists and the common folk. As we settled into the comfortable leather chairs in his spacious office, Yoshi, the general manager of Asano Taiko, told me the story of his company. One of the most successful taiko makers in Japan, Asano Taiko is a family-owned enterprise over four hundred years old. In 1609, not long after the powerful Tokugawa family seized control of Japan and ushered in over 250 years of relatively stable peace, a wealthy landowner of the Kaga clan sent Yoshi's ancestors to present-day Mattō City in Ishikawa Prefecture to establish a base for the manufacture of Noh drums as well as leather saddles, armor, and helmets for military use. The business expanded to include folk and festival drums in the Meiji period (1868-1912) and now encompasses an even wider variety of standard Japanese instruments along with entirely new, custom-designed drums. Perhaps unsurprisingly, company advertising highlights this impressive longevity, stating proudly that Asano Taiko "maintains into the present traditional techniques passed down since first receiving its charge in the seventeenth century." Even with such a long history, Yoshi, a seventeenth-generation taiko maker himself, expressed to me how much his company had benefited from the postwar surge in ensemble taiko drumming. Proof of this, he told me, was manifest in the very buildings surrounding us. Prior to the postwar emergence of ensemble taiko drumming, a single building housed the entire business, from production to sales. Now, the company grounds are a sprawling complex of several large buildings the manufacturer calls Asano Taiko Village. The "village" includes two state-of-the-art warehouses. The larger of the two is a multilevel, climate-controlled space where hollowed-out drum shells are left to air dry before being fashioned into drums. The other, smaller warehouse is packed tight with drums and filled with smoke. The smoke hastens the drying process, which is useful if a client needs a drum in less than the four or five years it normally takes to make one. There is also a large factory space full of blocks of wood, cowhides, and artisans working on drums at different stages in the manufacturing process. In addition to these manufacturing sites, the company headquarters also has a drum museum, which houses over one hundred drums from across the globe as well as taiko-related audiovisual materials, a product showroom, a high-tech practice space with vaulted ceilings and a specially soundproofed interior, a regular practice room for use by an Asano-sponsored professional taiko group and by students who come for workshops or weekly classes, and a "taiko culture research institute." The institute publishes the manufacturer's taiko-related journal, Taikology, along with other books on taiko history, production, and performance. Asano Taiko Village is not merely a location for the manufacture and sale of taiko drums, the promotional literature says, but a place where all things related to taiko can be "seen, heard, and learned." Midway through our interview, Yoshi gave me a tour of the grounds. Stepping into the sunlight, we threaded our way through piles of huge tree trunks waiting to be cut and processed. Having made so many large ōdaiko drums to meet burgeoning domestic demand, the company has begun importing giant tree trunks from Africa. (As mentioned earlier, an ōdaiko is fashioned out of a single block of wood, not slats, so the size of the woodblock-the size of the tree-determines the size of the drum.) Once inside the factory, Yoshi showed me how processed blocks of wood are hollowed out into drum shells, and then after years of drying in the warehouse are carved by hand on the inside with distinctive patterns that enhance the resonance of the finished drum (the exact patterns used differ by manufacturer and are trade secrets). Several cowhides were hanging to dry from the ceiling, illuminated from behind. As we passed them, Yoshi paused a moment to point out how uneven the skin was. Here where the skin is thinner, he said, we will use it to make a smaller drum; here where it is rougher and thicker, we will stretch it over a larger drum that needs to withstand much more vigorous pounding. Years of experience had cultivated the now middle-aged manager's keen eye for the subtle properties of different skins-whether from bulls or cows, domestic or foreign cattle-as well as different kinds of wood. Once dry, he continued, the skins become hard and tough. They are stretched over drum shells with ropes and wooden dowels, and then they are tightened by hand until the appropriate tone is reached. (Knowing how much tension to apply requires considerable skill, because the timbre will continue to change slightly even after the drum is finished.) Once the appropriate tension is reached, artisans attach the hide to the drum with small metal rivets that are pounded neatly in two rows around the drumhead. We sat down again for a cup of tea, and Yoshi told me how hard he had worked to bring about the current success of his company. Given the rapid and recent expansion of his Asano Taiko, the drum maker had needed to go outside the immediate family and hire locals to help out in the factory. Yoshi told me plainly that he had worked hard to make Asano Taiko a place where someone "wouldn't be ashamed to work," especially the young women who helped out in the factory and store. His parents had been sloppy account managers, hastily rushing to gather up financial papers when authorities arrived to examine them. Without hesitation, Yoshi gestured at two framed certificates hanging on the wall beside us. Beaming with pride, he told me that the certificates were from the national tax office. The company had received them as awards for outstanding tax preparation in two separate years. Why would someone be ashamed to work at a taiko manufacturer, especially one as successful as Asano Taiko? And why of all things would the general manager be so proud of paying corporate taxes that he would hang these certificates on the wall and point them out to me? The answers to these questions lie in the fact that the Asano family, like virtually all taiko makers in Japan, belong to an outcast group called burakumin, or buraku people. The term literally means "hamlet people," and, although their exact origins are uncertain, most scholars agree that the burakumin trace back to another outcast group, called senmin, that coalesced in the Tokugawa period (1603-1867) (DeVos and Wagatsuma 1966; Donoghue 1978; Henshall 1999, 49). The senmin comprised mostly eta (literally, "great filth"), who worked in so-called polluting occupations such as butchery, tanning, leatherwork, and grave digging, and hinin ("non-persons"), who were social undesirables such as itinerant musicians, fugitives, beggars, and vagabonds. The Tokugawa authorities socially and legally marginalized these groups, effectively transforming them into outcasts. Because the construction of taiko involves handling the carcasses and skins of animals, the work was considered polluting by the Buddhist-influenced government and hence left to members of this new class. Although official occupational discrimination was abolished with the passage of the Emancipation Edict in 1871 at the end of the Tokugawa shogunate, unofficial social discrimination against the burakumin has persisted into the contemporary era. Employers, as well as marriage agencies, have been known to check the family registers of applicants for evidence of residence in a known buraku community. Buraku youth continue to have lower rates of academic success and lower levels of occupational attainment than their peers (Henshall 1999, 50; Hill 2003, 81-82; Kitaguchi 1999). This alienation leads some buraku youth to turn to crime or violence; although reliable statistics are hard to find (Bondy 2010), estimates indicate the disproportional involvement of buraku youth in Japan's notorious yakuza crime families (Ames 1981; Henshall 1999, 52; Kaplan and DuBro 2003, 132-133). While many majority Japanese are sympathetic to the plight of the buraku people, the presumed association with violence and crime has contributed to a general unease and wariness toward them. It was to this prejudice against and generalized suspicion of buraku people that Yoshi referred in his discussion with me. In fact, he told me that his own family had to deal with issues associated with a family register check when his daughter married a few years earlier. Thus, the awards from the national tax office stood as official recognition of the integrity of his, a buraku's, business. Given the status of taiko makers as part of a historically segregated population, the four-hundred-year history of Asano Taiko Corporation represents not just the maintenance of an unbroken tradition of craftsmanship but also the legacy of generations of discrimination. Yet just as the drums the company makes have moved into a position of prominence in the wake of the taiko boom, taiko makers have been greeted by unprecedented demand for their instruments. This demand has not only engendered economic benefits; it has also enabled taiko makers (and buraku groups more generally) to reimagine their taiko-making techniques as Japanese "tradition" and to advocate for the elimination of all remaining discrimination against them. Perhaps the clearest illustration of these two aims is found among the residents of the Naniwa district in metropolitan Osaka City. According to the general manager of Asano Taiko, there is approximately one taiko manufacturer per prefecture in contemporary Japan. (Some regions have more than one.) One of the largest concentrations of taiko manufacturers in Japan is found in the Naniwa Ward of Osaka City, an area located at the southern reaches of the Osaka Loop Line that also happens to be home to one of largest populations of burakumin in Japan. Naniwa Ward is an officially designated "assimilation area." Assimilation areas are former buraku areas that received special funding from the Japanese government to improve living conditions following the passage of the Special Measures Law for Assimilation Projects in 1969 (Neary 1997, 64). Known chiefly for the production of leather goods and, of course, taiko, Naniwa Ward is an economically depressed region of one of the urban areas hit hardest by Japan's prolonged recession. On my first visit there, I took a wrong turn and stumbled onto a series of dilapidated cardboard shacks shrouded in bright blue tarp, the temporary abodes of homeless people living under a busy elevated freeway. Present-day Naniwa Ward encompasses a buraku area formerly known as Watanabe Village. As in other urban communities in Japan, local elites have worked to reclaim the "old village" (furusato) within the newly amalgamated urban space as a basis for civic community (Bestor 1989; Ivy 1995; J. Robertson 1991). Had I gone the other way on my first visit to the area, I would have been led toward the Osaka Human Rights Museum along the Road of Human Rights and Taiko (Jinken Taiko Rōdo). Opened in late 2003, the Road of Human Rights and Taiko is the result of efforts by the Osaka City government, the Naniwa branch of the Buraku Liberation League (BLL)-a major advocacy group for buraku issues-and other local groups. The road's construction was intended not only to help bring tourists to the area and the museum but also to reclaim the three-hundred-year history of drum making in the community. The impetus to create the road emerged in response to the success of an ensemble taiko group made up of local youth. This group, Taiko Ikari (literally, "Taiko Rage"), formed over a decade earlier as this younger generation became conscious of the loss of a tradition of taiko drumming in the area. The "rage" in the group's name reflects its mission to advocate through performance the elimination of all kinds of discrimination in Japan and throughout the world. Given the group's local roots and commitment to buraku issues, it is surprising that its founding was in fact a response to the activities of a taiko ensemble quite far away. Prior to the formation of Ikari, a group of ensemble taiko drummers from Okinawa called Zampa Ufujishi Daiko visited the legendary taiko-making area of Naniwa in search of high-quality drums to use in their performances. Originally stimulated by new ensemble taiko groups from the mainland, the Okinawan drummers were surprised to find that there were no competent taiko players in an area known widely for its abundance of taiko manufacturers. Zampa's inquiries prompted elites in the area to reflect on the irony of this situation. The local chapter of the BLL subsequently invited Zampa to perform a concert in support of rights for burakumin and Okinawans living in the Osaka area. Inspired by the example of the Okinawan drummers, several younger members of the community began playing taiko themselves, carefully mimicking the movements they saw on videotapes of Zampa's performances. Eager to support what appeared to be a nascent local taiko ensemble, the BLL helped provide material and financial assistance to the group. Although many of the young drummers had initially joined out of a desire to stand out, look cool, and gain status in the neighborhood, once they saw the strong emotional reactions of their older neighbors they began to take more seriously their newfound roles-buraku drummers playing instruments that their buraku ancestors had suffered to produce. The fact that there were no impressive taiko drummers in the community, they reasoned, was "nothing more than a manifestation of the long history of discrimination" (Terada 2008, 311) directed against members of the community. No longer content to remain in the background while their instruments were taken up enthusiastically by other Japanese, in locations as far away as Okinawa, they resolved to play, with the purpose of revealing and overcoming all forms of discrimination (310-311). In an interview, the current leader of the group recalled an experience of one group member. A son of a taiko maker in the community hoped to marry someone from outside the community, but his fiancée's father opposed the marriage on the grounds of the young man's status as a burakumin. After seeing a performance by Taiko Ikari, however, the father changed his mind. Realizing his prejudice, he told the boy that he would feel silly if he continued to resist the marriage. He had found Ikari's performance to be full of spirit and passion and was impressed by how much it moved the audience. He now recognized the importance of taiko making and performance. When the man thanked the group and told them this story, they wept openly and recognized anew the power of their performance. An older member of the community confirmed the young leader's account in a recent documentary: "I know the story sounds like something out of a movie, but it actually happened!" (Terada 2011). Despite its passion, the early Taiko Ikari had far more pride than skill. This became clear a few years after the group began performing, when they received a visit from Jishōya Ichiro, a former leader of Ondekoza who happened to live nearby. As a member of Ikari put it to me, after Jishōya made just a few strikes of the big ōdaiko drum, the group members realized his skill. After learning about his performance background, the drummers asked him to help them improve. Jishōya admired their enthusiasm but commented that their performance left the audience more "tired" than inspired. He taught them new pieces, many of which they still play, and new approaches to playing that dramatically improved the quality of their performances. With an increased local profile, stronger sense of mission, and enhanced set of taiko skills, Taiko Ikari came to serve as a model for other groups. Other BLL chapters soon started taiko groups, but the shared experience of oppression did not lead easily toward cooperation. As the ethnomusicologist Yoshitaka Terada states, "There is a strong tendency among Buraku people ... to distrust outsiders, presumably in order to protect themselves from discrimination. This tendency is found even among Buraku people and ... [has led to] sectional rivalry ... [that] has prevented [Buraku-based] taiko groups from interacting with each other." Still, attempts have been made to overcome these differences through performance. One concert in 1999 featured eleven different buraku groups and over one hundred drummers (Terada 2008, 313). I attended a similar concert in late July 2008 that featured four buraku groups from the Osaka area. In the rehearsal, the performance, and the after-party, unity was the prevailing theme. The groups took direction from one another in practice, shared drummers across pieces during the concert, and swapped stories in the jocular atmosphere of the party. Even so, during the after-party, a hint of physical competition broke with the general spirit of camaraderie. A series of arm-wrestling matches began between members of different groups (into which even this out-of-shape anthropologist was drafted). Nevertheless, the conversations I had with drummers, along with the satisfied smiles on the faces of young drummers and more senior organizers of the event, indicated to me that the performance was greeted enthusiastically by many involved. This bodes well for a future in which drumming continues to provide a shared basis for advocating equality and eliminating discrimination against the burakumin and other minority groups in Japan. Along with providing a new form of advocacy, the (re)appropriation of taiko drumming by the descendants of taiko makers is yet another tangible manifestation of the taiko boom and its positive effect on the formerly marginalized individuals, like the employees of Asano Taiko Corporation, who make the instruments at the center of ensemble taiko performance. If the interest of an Okinawan group had not been stimulated by the popular new taiko drumming of the mainland, it is likely that Taiko Ikari would not have emerged when and how it did. If the development of compelling performance techniques by new taiko professionals like Jishōya Ichiro had not occurred, Taiko Ikari clearly would not look and sound like it does. If the success of the early ensemble taiko groups had not begun to generate popular national and international interest in Japanese taiko drumming, Taiko Ikari would have encountered greater difficulty gaining visibility and securing performance opportunities. This in turn would likely have delayed the utilization of ensemble taiko in other buraku areas. Of course, Taiko Ikari received early and significant financial support from local governmental and nongovernmental organizations. In this respect, the emergence of Taiko Ikari parallels patterns seen elsewhere in Japan. Nevertheless, the unique relationship of the descendants of buraku taiko makers to the new genre of ensemble taiko drumming adds a level of meaning and significance to their performance activities not found among other taiko groups in Japan. It also represents a point of pride for the community of Naniwa Ward, pride that is made publicly visible in the aforementioned Road of Human Rights and Taiko. Just as Taiko Ikari represents a movement to reappropriate a "lost" drumming tradition (in a novel form, of course), the Road of Human Rights and Taiko (hereafter, the Taiko Road) signifies a move to bring into public view, and thus to memorialize and celebrate, a long history of drum making in the community that had formerly been hidden out of shame. But the Taiko Road does not merely pause to reflect publicly on the past; it also looks toward the future, imaging a Naniwa community based on the protection of human rights and the elimination of all forms of discrimination. This combination of a concern for drum-making culture and for human rights may seem odd, but it makes sense in the context of recent shifts among buraku groups to couch narrower local concerns within the universalist discourse of global human rights (Neary 1997, 75). In this sense, claims for buraku rights and for recognition of buraku heritage are tantamount to the claims of any oppressed minority for its human rights. The Taiko Road connects the heritage of the Naniwa community with a broad understanding of human rights that includes advocacy for other minority groups. In this manner, it extends the goals of Taiko Ikari into the form of a public "field museum," as it is called. A new folk culture of drumming is appropriated to reflect on the past and present Naniwa community and to provide the basis for shared advocacy on behalf of Osaka's other major minority groups (figure 7). The Taiko Road is made up of nine zones that surround a central axis. This central axis, the Taiko Maker Zone, leads visitors on a five-hundred-meter path from Ashiharabashi Station to the Osaka Human Rights Museum (also known as Liberty Osaka). The central Taiko Maker Zone is marked by a series of round metal information kiosks shaped like taiko drumheads. The kiosks not only give directions to sites on the road or to nearby train stations but also contain longer, instructive passages on various taiko-related topics. One kiosk describes the emergence of ensemble taiko drumming as a new performing art; another explains the centrality of Watanabe Village in the history of Japanese taiko production. Other kiosks utilize images to depict the seven stages of the taiko-making process: the transformation of a tree trunk into the body of a drum; the techniques used to convert cowhides into drumheads (notably, the first few steps of this process are described in text only); and the methods involved in fastening the finished skins on the drum shells. At the bottom of all the kiosks are directions to the Osaka Human Rights Museum, written in Japanese, English, Chinese, and Korean. Perhaps more striking, everyday objects modified to reflect the heritage of drum making in the community are placed strategically along the road. Right outside Ashiharabashi Station, for example, a wheelchair-accessible telephone booth has half a taiko shell jutting out of its top. Farther down the road, flowerpots fashioned in the shape of taiko drum shells decorate the entrance to the Naniwa Human Rights Culture Center. Bus shelters lining the road have benches with armrests that look like the riveted heads of taiko drums. During the day, these shelters announce the imminent arrival of buses with the sound of taiko drumming. The drumming is a recorded performance of Taiko Ikari, reflecting the subtle yet significant recognition of the group's importance to the community that runs through the exhibits along the road. Small posters placed around the bus shelters display images of different kinds of taiko, and informative panels located above the benches tell visitors about taiko design and construction, such as the rivets that attach drumheads to drum shells and the carrying handles fastened to the sides of the drum body. One particular panel displays an example of taiko notation used by Taiko Ikari. The taiko score is printed not on paper but on a rectangular piece of dried rawhide, joining together the two buraku industries of leatherwork and taiko making. The terminus of this section of the road opens on the left into Tamahime Park (Jeweled Princess Park). Standing in the center of the park, encircled by a wooden bench, is a tall zelkova tree. The tree's placement at the center of the park is an indication of its symbolic importance: known for its strength and beautiful grain, zelkova is one of the most popular woods for taiko. Just beyond the main entrance to the park stands another important landmark. On top of a series of curved wooden slats, which are designed to appear as if they have sprouted up from the ground, sits a large clock tower. The tower rises to a height that makes the clock visible from some distance, but it does not merely indicate time. At six points in the day, the tower opens up to reveal two wooden puppets placed on opposite sides of a taiko drum. As the recorded sound of drumming emanates from the tower, the puppet drummers move on a rotating platform in a manner that mimics the choreography of the recorded taiko performance. (The recorded drum pattern here as well is played by Taiko Ikari, whose members also served as models for the puppets.) The clock tower is located on a site that used to be the home of the most prosperous taiko maker in the community, Taikoya Matabē. As the monument explains, it was the success of this merchant that brought renown to the Watanabe Village community of drum makers in the past. Reflecting this reverence for heritage, the curved slats supporting the tower are meant to represent the supportive hands of the Naniwa community, joined in the spirit of cooperation and respect for inherited culture. A walk down the main axis of the Taiko Road thus takes the visitor on an educational journey through the history and industry of the old and new Naniwa community. Rather than obscuring the history of leather production and taiko production, the road opens up this heritage for public consumption. Much like the Asano Taiko Corporation's celebration of its four-hundred-year tradition of taiko production, the past is not bemoaned as a shameful encumbrance but rather embraced as a valued inheritance of skills, knowledge, and culture. The ensemble drumming of Taiko Ikari is featured throughout the road as evidence of a vibrant new performing arts culture that builds on this local inheritance. References to the generations of discrimination that brought the community into being (and contributed to its longevity) are left off signposts, displays, and kiosks. (These are reserved for exhibits in the Osaka Human Rights Museum.) Instead, the road presents Naniwa as a community that is mindful of its past and concerned with the preservation of human rights into the future. One ward poster on the road gestures toward this new direction and to the centrality of respect for human rights in its vision of the future. It proclaims Naniwa Ward to be a community based on "Life, Love, and Human Rights," with tolerance and understanding for those who have different cultures and customs. Indeed, as one moves from the park through the Taiko Maker Zone toward the Osaka Human Rights Museum, several bronze statues of drummers ground these more abstract notions of human rights within the more accessible context of drum culture. Perhaps predictably, the first statue one encounters is a representation of wadaiko (Japanese drumming). Two male drummers stand playing large and small chū-daiko while a third sits in front of a shime-daiko. Echoing the theme of taiko production as well as performance, the monument explains the process used to make the drums shown. Informants told me that the drummers from Ikari posed as models for this statue, expressing once again the association between the road and Taiko Ikari. Farther down the street is a statue of three Okinawan eisa drummers. Their drums, playing position, and costumes clearly differentiate them from those displayed in the statue of the wadaiko drummers. The monument explains that eisa is a drum-dance style native to Okinawa. Now a part of Japan, Okinawa was not always so. (An independent kingdom until the seventeenth century, Okinawa was also a U.S. territory from 1952 to 1975.) Possessed of ethnic characteristics that distinguish them from mainland Japanese, Okinawans compose one of Japan's largest minority groups (Taira 1997). Here, the statue stands as a testament not just to the existence of this significant national minority but also to something much closer to home. Not far from Naniwa Ward, the Taishō Ward of Osaka contains one of the largest concentrations of Okinawans on the mainland. The statue explains that the young members of this community took up eisa drumming in the mid-1970s as a means of performing ethnic heritage. The statue functions to include the Okinawan minority, ambivalent members of a national Japanese community that has sometimes denigrated them as backwards, as a part of the multiethnic tapestry of modern Osaka. Just beyond the statue of eisa drummers is a statue of four musicians (three women and one man) seated in the playing style of samul nori. Utilizing four ethnically Korean percussion instruments-janggo, jing, kkwaenggwari, and buk-samul nori derives from Korean folk music but was converted into a stage art in the 1970s, much like ensemble taiko in Japan (Hesselink 2004). Along with burakumin and Okinawans, ethnic Koreans constitute another of Japan's and Osaka's largest minority groups. In fact, one of the largest communities of ethnic Koreans in Japan is located in the Tsuruhashi district just east of Naniwa Ward. The descendants of Korean migrants to Japan before and during World War II, ethnic Koreans like these Osaka residents have suffered from discrimination at the hands of majority Japanese for generations (Chung 2006; Henshall 1999; Lee 2006). Unable to achieve citizenship without giving up their Korean heritage and adopting new surnames, ethnic Koreans commonly feel alienated from Japanese society, even though many do not even speak Korean (Henshall 1999, 62-65). Here, the arrangement of drummers symbolizes the ethnic Korean community of Osaka that, like the community of Okinawans, has taken up samul nori as a means of performing ethnic identity. The Taiko Road ends with another statue of generically "Japanese" drummers. This time, the statue features hayashi-daiko, a style of playing that utilizes shoulder-harnessed okedō-daiko drums. This style of playing has been associated historically with folk performance in northern Japan. (In its contemporary manifestation, though, this playing style has also been heavily influenced by the Korean style of playing the shoulder-harnessed janggu). Here, this "regional" playing style is rendered generically as another form of wadaiko. In contrast to the first wadaiko statue, however, this one features a woman holding and playing a drum as well as two men, breaking with the masculine orientation of the other statue and perhaps signaling the popularity of taiko drumming among Japanese women. Across from this final statue lies the entrance to the Osaka Human Rights Museum. Inside the museum is a series of exhibits about the largest minority populations in Japan-the burakumin, ethnic Koreans, Okinawans, the Ainu of Hokkaido-and other groups in Japanese society that have suffered from discrimination, such as women, gays and lesbians, the disabled, homeless, HIV/AIDS sufferers, as well as victims of leprosy, Minamata disease, and other forms of industrial pollution. The four statues of drummers thus provide a space of transition from the celebration of taiko production and performance in the Taiko Maker Zone and the concern with human rights in the museum. Japanese, Okinawan, and Korean drumming are not displayed for their intrinsic interest alone but function to demonstrate the commitment of community leaders to move in solidarity with all discriminated communities in Japan, locally in Osaka, and even beyond Japan throughout the world. Knitting these large Japanese minority groups even closer together is their shared use of drumming to perform ethnic identity. Visiting the Taiko Road in the summer of 2008 allowed me to recall an experience I had in 2000 during my fieldwork with the taiko ensemble Kodo. One weekend morning, as I sat working on translations in the Kodo office, Akira, an office manager, came to my desk with an excited look on his usually somber face. He carried in his hand a copy of that morning's Nikkei newspaper (a nationally circulating financial newspaper like the Wall Street Journal or Financial Times). He opened up the front section of the paper and showed me a full-page advertisement that had been taken out by the Asano Taiko Corporation. The advertisement celebrated the company's achievement in having received a Good Design Award for one of its custom-designed drums. This was the first time that a taiko maker had received such an award (the company has gone on to win two more), and it appeared that the Asano Corporation was eager to publicize its achievement. Akira asked what I thought the advertisement meant. I told him that the advertisement probably demonstrated the company's pride in receiving the award, but he seemed unconvinced. Shaking his head slightly, he said, "Well, sure they're proud. But this is more than just pride. I think there's an attempt to compensate for some feelings of inferiority. There's pride, and then there's a full-page ad in the Nikkei ..." At the time, I found Akira's comment to be a bit harsh. Reflecting on my research since, however, I think that he pinpointed early on the desire for recognition that underlies Asano Taiko's business and cultural activities, Taiko Ikari's mission, and the organization of the Taiko Road. This chapter began with a description of the major genres of Japanese musical performance and the function of drums within them. As one moves further from the center of "traditional" theatrical performance and closer to peripheral performance styles (literally "peripheral," in the spatial sense of regional or rural places), the use of taiko increases. This peripheral status as well as the informality and flexibility associated with it contributed greatly to the emergence and popularization of ensemble taiko drumming. Ultimately, this led to a shift in the place of taiko from the margins of performance in gagaku, Noh, and kabuki to the center of new taiko ensembles. The emergence of taiko ensembles and the ensuing taiko boom helped bring about a movement from the margins to the mainstream of cultural consciousness for the drum makers as well as the drums. The presence of the Asano Taiko Corporation, the members of Taiko Ikari, and the taiko makers of Naniwa Ward in Osaka at the heart of one of Japan's most vibrant performing arts provides as much evidence of their long commitment to drum making as the surge in the popularity of taiko drumming called the "taiko boom." This new popularity of Japanese drumming, though not actually stimulated by the burakumin, has enabled members of this formerly marginalized occupational caste to reappropriate their heritage as part of yet another Japanese cultural tradition. It has also enabled them to advocate in solidarity with other minority groups that have faced obstacles in Japanese society. With its thunderous sounds and dazzling choreography, Japanese taiko drumming has captivated audiences in Japan and across the world, making it one of the most successful performing arts to emerge from Japan in the past century. Based on ethnographic fieldwork conducted among taiko groups in Japan, Taiko Boom explores the origins of taiko in the early postwar period and its popularization over the following decades of rapid economic growth in Japan’s cities and countryside. Building on the insights of globalization studies, the book argues that taiko developed within and has come to express new forms of communal association in a Japan increasingly engaged with global cultural flows. While its popularity has created new opportunities for Japanese to participate in community life, this study also reveals how the discourses and practices of taiko drummers dramatize tensions inherent in Japanese conceptions of race, the body, gender, authenticity, and locality. Shawn Bender is a Cultural Anthropologist and Assistant Professor of East Asian Studies at Dickinson College. Taiko electrified: The game “Taiko Master” (taiko no tatsujin) is an electronic manifestation of taiko’s recent popularity. 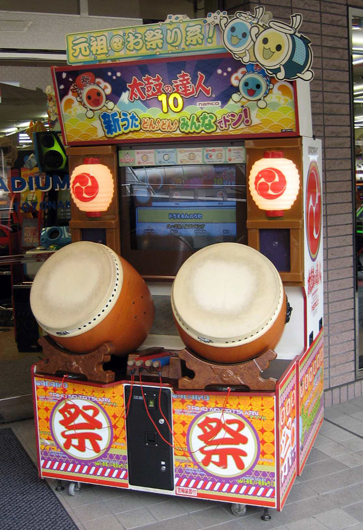 Players use wooden taiko mallets to tap on the drums in sync with various popular and folk tunes the machine plays. Photo courtesy of Miyamoto Unosuke Co., Ltd.
noh drums (L to R: ō-tsuzumi, ko-tsuzumi, shime-daiko). 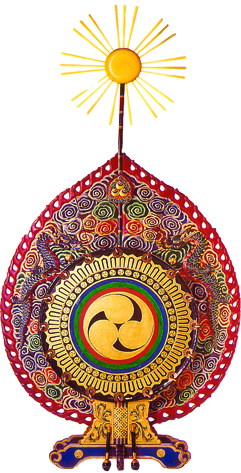 bon-daiko (chū-daiko on diagonal stand used by Sukeroku Daiko and other groups). Information kiosk on the Taiko Road shaped like a taiko drumhead. A telephone booth on the Taiko Road has been modified to reflect community heritage. Flowerpots in the shape of taiko decorate the entrance to the Naniwa Human Rights Culture Center. Bus shelters lining the Road have benches with armrests that look like the riveted heads of taiko drums. Taiko score on window of bus shelter displays an example of taiko notation. The score is printed on a rectangular piece of rawhide, thus joining together the two local industries of leatherwork and taiko making. Marking the site of the former home of a legendary taiko maker, a clock tower rises in the midst of Tamahime Park. Six times a day the window shades open to reveal drum-playing puppets. Statue of drummers playing in the generically “Japanese” style of wadaiko. Statue of Okinawan eisa drummers represents the Okinawan community in Osaka. Statue of drummers seated in the Korean drumming style of samul-nori represents the Korean residents of Osaka. Statue of drummers playing in the Japanese hayashi style.